The Kyjen Jigsaw Glider is a board game style puzzle toy with four different treat-holding cavities and three moving pieces. This toy moves in a somewhat different manner than many of our other puzzles, so it presents some unique challenges. I find this toy visually appealing because I love jigsaw puzzles. The Jigsaw Glider has two purple pieces that slide away from each other to reveal two of the treat wells. The green piece in the center slides back and forth to reveal additional wells beneath the ends. 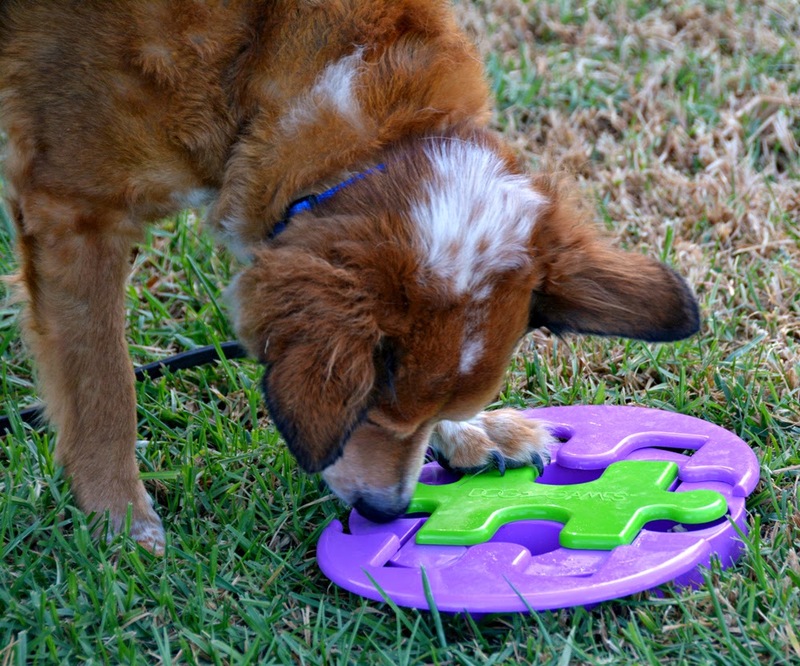 The Jigsaw Glider was easier for Brisbane to solve than the Kensington Kennel Club slider puzzle The entire surface of the toy is made up of sliding pieces, rather than just a few small inset parts. It's much easier to solve by accident, too. 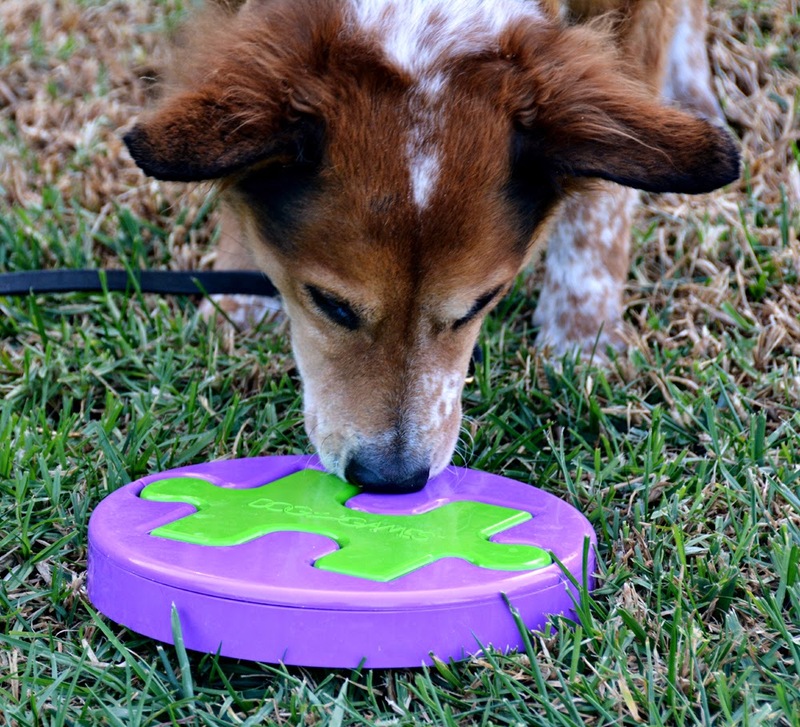 Part of the challenge with this toy is that the green piece covers up three treat wells when revealing the fourth. There is a lot of movement required, and the puzzle doesn't stay solved once it's been opened. I think I can fit half a cup of kibble in here. Very easy to dump in with a measuring scoop. This toy gives Ulysses a bit of a challenge, but is not impossible. Briz got the hang of the Jigsaw Glider right away, it takes longer for him to open it than it does to inhale his food out of a bowl, but not that much longer. I think Ru would be able to use this puzzle if he actually cared about food enough. A very large dog might have difficulty getting the food out of the little holes. Xhuuya the raven likes to pull the purple sliding parts off the Jigsaw Glider, so I know they come off pretty easily. Rubber feet plus close supervision mean I never hear this thing thunking around on my hardwood floors. Since this is a toy made for use with supervision, I never have to worry about losing it. It has a lot of nooks and crannies, but it can be cleaned thoroughly. Raven-approved. This puzzle does not require thumbs, pinchers, or pointy teeth to solve, and can be use by dogs, cats, corvids, and probably toddlers.